AK suggested kimono (着物) and kinako (黄粉 / roasted soybean flour); Japan Australia suggested kitsune (狐 / fox), the Kinki region (近畿地方 / also called the Kansai region), and Kinka (金華山 / a mountain in Gifu); Zooming Japan suggested Kimura Takyua (木村 拓哉 / actor and member of the band SMAP), Kintai-kyo (錦帯橋 / a bridge in Iwakuni, Yamaguchi Prefecture), and kibi dango (吉備団子 / Okayama’s famous dango – a kind of snack); Francoise suggested kitsune, Kibune (貴船 / a small town in Kyoto), Kinkaku-ji (金閣寺 / Temple of the Golden Pavilion), Kitayama (北山村 / a village in Wakayama), Kiyomizu-dera (清水寺 / a temple in Kyoto), the Kinki region, kimono, and Kinokuniya (紀伊國屋書店 / a famous book store); UK Seikatsu suggested Kiyomizu-dera, Kitano-tenmangu (北野天満宮/ a shrine in Kyoto), Kinkaku-ji, Kibune-jinja (貴船神社 / a shrine in Kyoto), Kitanoumi (北の湖 / a famous sumo wrestler), Kimigayo (君が代 / the national anthem of Japan), and kitsune udon (きつねうどん / udon topped with deep-fried tofu); Haruko-chan suggested kinpira gobo (金平ごぼう / cooked gobo – a vegetable, kitsune udon, and kimuchi (きむち / a Korean dish which is popular in Japan); Sequins and Cherry Blossoms suggested kitsune udon and kinoko (きのこ / mushroom); and Jay Dee suggested Kiyomizu-dera, Kinki Kids (キンキ キッズ / a musical duo), Kitano Takeshi, Kit Kat (キットカット), Kita-dake (北岳 / the second tallest mountain in Japan), and the Kita Alps (北アルプス / the Hida Mountains). I’ve omitted a few suggestions which began with きょ (kyo) as, although they do begin with き (ki) I might do some of the combined sounds at a later stage. Kiyomizu-dera (officially called Otowa-san Kiyomizu-dera (音羽山清水寺)) is one of the most famous Buddhist temples in Kyoto, and is part of the Historic Monuments of Ancient Kyoto (Kyoto, Uji and Otsu Cities) UNESCO World Heritage site. The temple was originally founded in the early Heian Period (794 to 1185), and the buildings you see there now were constructed in 1633 at the order of Tokugawa Iemitsu. One of the truly incredible things about Kiyomizu-dera is that not a single nail was used in the building of the entire structure. The huge 12-metre hight pillars are made from keyaki (Japanese zelkova), and the floor was made using 410 cypress boards. In the picture above you can see crowds of tourists on the stage, which is a viewing platform. This is one of the most famous views in Kyoto, and a trip to the city simply wouldn’t be complete without a visit to this famous spot. Kiyomizu-dera, which means ‘temple of clear water’, takes its name from the Otowa Waterfall which is on the temple complex. 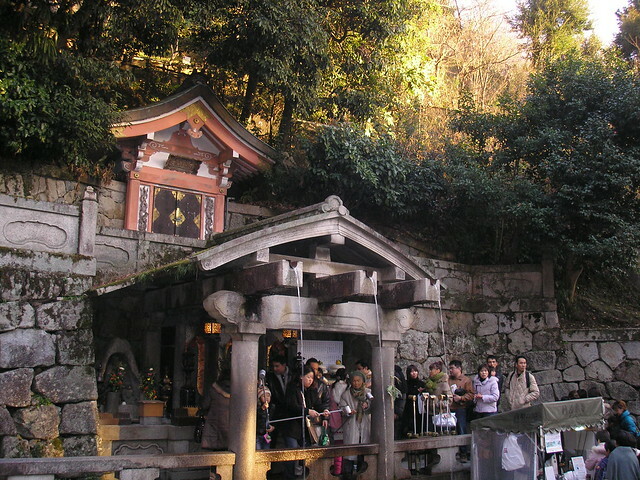 There are usually queues of people near the waterfall, lining up to have the chance to catch and drink some of the water, which is said to have the power to grant wishes. The water is split into 3 streams, each said to have a different power – longevity, success at school, and a fortunate love life. It’s considered greedy to drink from all three streams though, so choose wisely! During the Edo period (1603 to 1868) there was a belief that if someone survived the 13 metre jump from the stage, their wish would be granted. People would talk about ‘jumping off the stage at Kiyomizu’, much as we talk about ‘taking the plunge’ in English. Apparently 234 jumps were recorded during the Edo period, and of those 85.4% survived. Jumping from the stage is now prohibited. Although Kiyomizu-dera is a total tourist trap during peak season (especially spring and autumn), it’s still an absolute must-see stop on any tour of Kyoto. 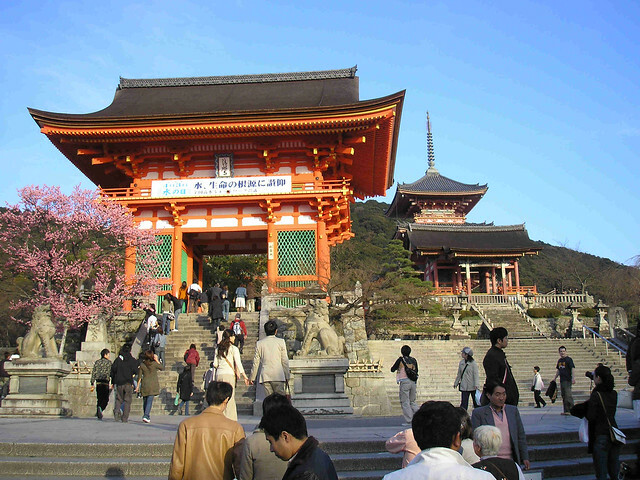 Find out more on Kiyomizu-dera’s website. 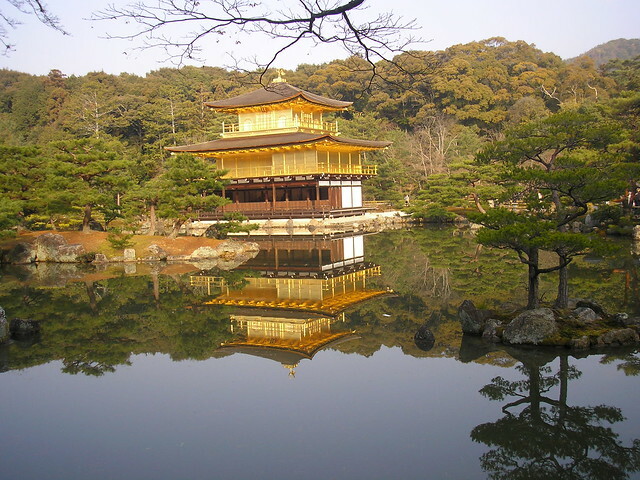 Kinkaku-ji, the Temple of the Golden Pavilion, is probably one of Kyoto’s, if not Japan’s, most famous landmarks. Like Kiyomizu-dera, Kinkaku-ji is part of the Historic Monuments of Ancient Kyoto (Kyoto, Uji and Otsu Cities) UNESCO World Heritage site. Although known by everyone as Kinkaku-ji, the temple’s formal name is actually Rokuon-ji (鹿苑寺), meaning ‘Deer Garden Temple’. The golden temples sits in a beautiful garden complex, which is an example of Muromachi period (approximately 1337 to 1573) garden design. My understanding of garden design during this period is that the emphasis was on simplicity, and finding a way to incorporate the building into the landscape of the garden. I think Kinkaku-ji looks quite different to other Japanese temples, and this is probably because it started out as a villa. The villa, belonging to the powerful statesman, Saionji Kintsune, was purchased by the Shogun Ashikaga Yoshimitsu and converted into the Kinkaku-ji complex. When Yoshimitsu died, it was his wish for the building to be converted into a Zen temple by his son. The present structure was rebuilt in 1955, and is said to be a close copy of the original. The pavilion is covered in gold leaf, which is supposed to purify any pollution or negative feelings towards death. It also makes it look stunning when the sun shines. 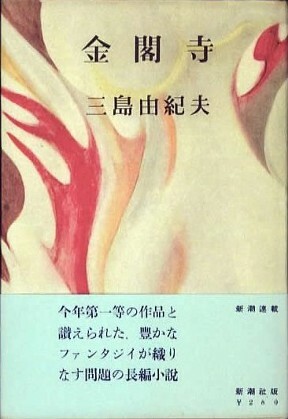 Author Yukio Mishima wrote a well-known book (which I haven’t read yet) called The Temple of the Golden Pavillion (金閣寺), published in 1956. It is a fictionalised version of some events which happened in the 1950s. 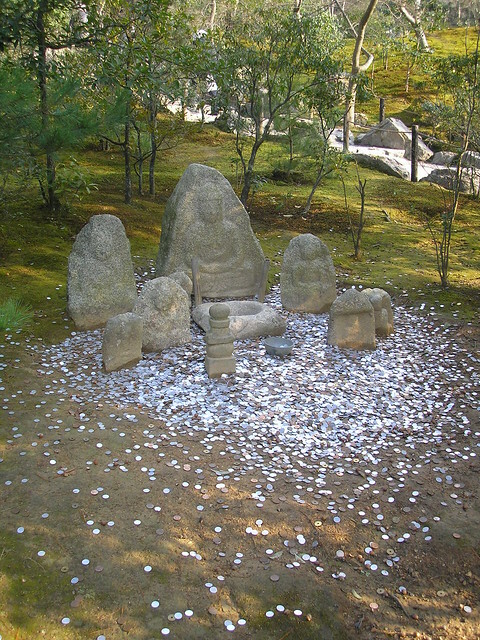 On 2nd July 1950, the pavilion was burned down by a 22-year-old monk called Hayashi Yoken, who then attempted suicide on the Daimon-ji hill behind the building. He survived however, and was taken into custody. The monk was sentenced to seven years in prison, but was released because of mental illnesses in September 1955. He died in 1956. Like Kiyomizu-dera, Kinkaku-ji can be a total tourist trap, but you can’t visit Kyoto and not see it. To find out more about Kinkaku-ji, visit JNTO. Next week we’ll start with く (ku), so please leave a comment below suggesting a topic for things beginning with く. Topics can be anything, as long as they are connected to Japan – food, places, people, characters, whatever you want to hear about! Just remember that the words you suggest must be Japanese (for example, you can’t suggest ‘kumquat’ (a fruit – I know, random word choice, but hardly any words begin with ‘ku’!) for ‘ku’, because ‘kumquat’ in Japanese is ‘kinkan’, but you could suggest ‘kuma’, which is a bear. I’ve only been once to the Golden Temple. 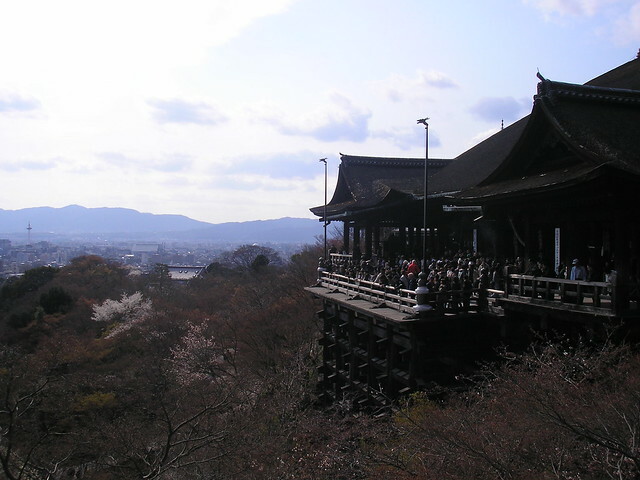 It’s not so impressive, but I’ve been to Kiyomizudera several times. I just like it there, but only if it’s not so crowded! Yes, I agree, Kiyomizu-dera is better if it’s not crowded. Of course, I second Kumamoto and Kusatsu. But I’d like to add Kumon (juku that has spread to other countries), kushiage (delicious food fried on a stick), Kurosawa Akira (the legendary director), and Crayon Shin-chan (popular manga and anime). Somehow I found it difficult to think of words starting with ‘ku’. Here are the things I came up with: kudamono (fruit is so expensive in Japan, yet always of high quality), kudasai, kuruma (japanese cars are so boxy and square). Two of my favourite places in Kyoto. I’m still waiting to shoot Kinkakuji in winter when all covered in snow. I love the gardens as well at this place. Kiyomizu-dera is probably my favourite spot to visit in Kyoto and love the whole unique experience of the place.